MOUNTAIN VIEW, CA--(Marketwired - Jan 6, 2014) - Audience, Inc. (NASDAQ: ADNC), the leader in advanced voice processing for mobile devices, today announced the Audience eS700 series, a family of Always-on intelligent voice and audio solutions that enables new levels of voice interaction with smart devices. The Audience eS700 series consists of the eS750 range of best-in-class smart audio codecs and the eS700 range of stand-alone voice processors. A key new addition to Audience's Advanced Voice suite of features is VoiceQ, which enables a device to continuously listen to its surroundings, and act upon a configurable voice command without the need for interaction via touch, with minimal battery life impact. "We believe that dependable, Always-on voice detection and actuation is the next must-have mobile technology," said Peter Santos, president and CEO, Audience. "Our experience in delivering low-power, high-performance Advanced Voice makes us uniquely capable to deliver on the promise of a compelling Always-on voice experience." Technology that enables the device to wake up based on factory-programmed or user-dependent keywords, even in noisy conditions. Continuous VoiceQ eliminates the need to pause between the wake-up command and the rest of the instruction - "OK Audience -- play music." The device wakes up only when needed, enabling ultra-low-power -- < 1.5 mA battery current drain -- Always-on voice sensing. Industry-leading signal to noise ratio (SNR) performance for stereo headphones and high power support for earpiece. Industry-leading noise suppression even in windy conditions, with support for up to three microphones. Full-Band (48 kHz) voice processing. Patented technology delivering high word accuracy rate when performing voice commands or voice-enabled searches, even in busy streets. A new API enables OEMS to access these features, and create applications that deliver new user experiences and new levels of touch-less interaction with mobile devices. 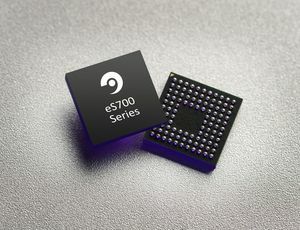 The eS704 and eS702 (Advanced Voice processors), and the eS754 and eS752 (with smart audio codec) are sampling today with customers, and consumer devices featuring these processors are expected to be in the market in the second half of 2014. Statements in the press release regarding Audience, Inc., which are not historical facts, are "forward-looking statements" within the meaning of the Private Securities Litigation Reform Act of 1995. These forward-looking statements may be identified by terms such as believe, will, expect, and could and the negative of these terms or other similar expressions. These statements, including but not limited to expectations regarding the importance of Always-on functionality in mobile devices and the anticipated shipping dates of devices incorporating our eS700 chip, are based on current expectations and assumptions that are subject to risks and uncertainties. Our actual results could differ materially from those we anticipate as a result of various factors, including: market demand for Always-on functionality; our dependence on adoption by OEMs; the success of our OEM customers' products; competition in the mobile device markets; and other risks inherent in fabless semiconductor businesses. For a discussion of these and other related risks, please refer to "Risk Factors" in our most recent Form 10-Q, which is available on the SEC's website at www.sec.gov. Forward-looking statements represent our management's beliefs and assumptions only as of the date made. We assume no obligation to update these forward-looking statements.